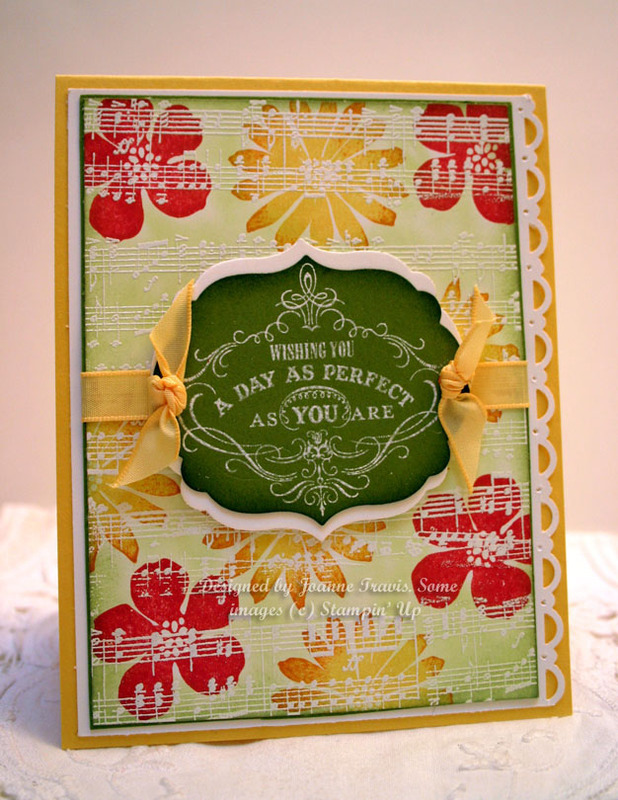 New Stampin' Up Secret Garden stamp set and matching framelits. Crumb Cake and Whisper White cardstocks, Inks: Real Red, Daffodil, Celery, Bashful Blue, Eggplant, Olive with matching buttons. Happiest Birthday Wishes for sentiment. Card is inspired by a scrapbook page in an old Stampin' Success demonstrator magazine. The new Stampin' Up Tea For Two designer paper was the inspiration for my project today. 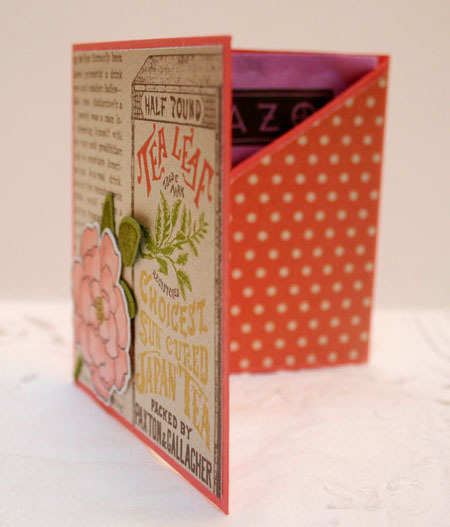 A very easy tea bag holder card in Coral that measures 3 1/4" x 9 3/4" and scored at 3 1/4" and 6 1/2". Cut a diagonal piece off of the last panel to display tea bag. (By eye is a fine measurement for this). 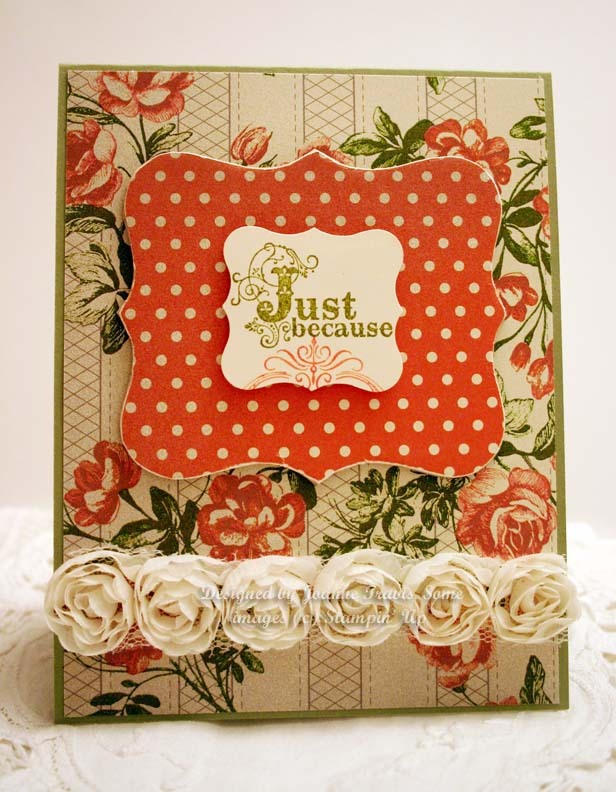 Secret Garden stamp set and matching framelits dies were used for flower embellishment on front. 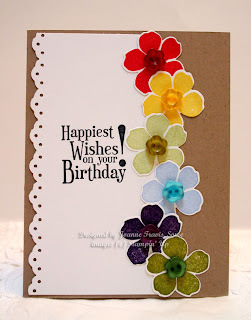 Sentiment is from Field Flowers. 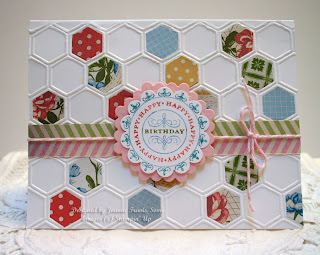 I love the new Honeycomb embossing folder from the upcoming SU mini catalog. 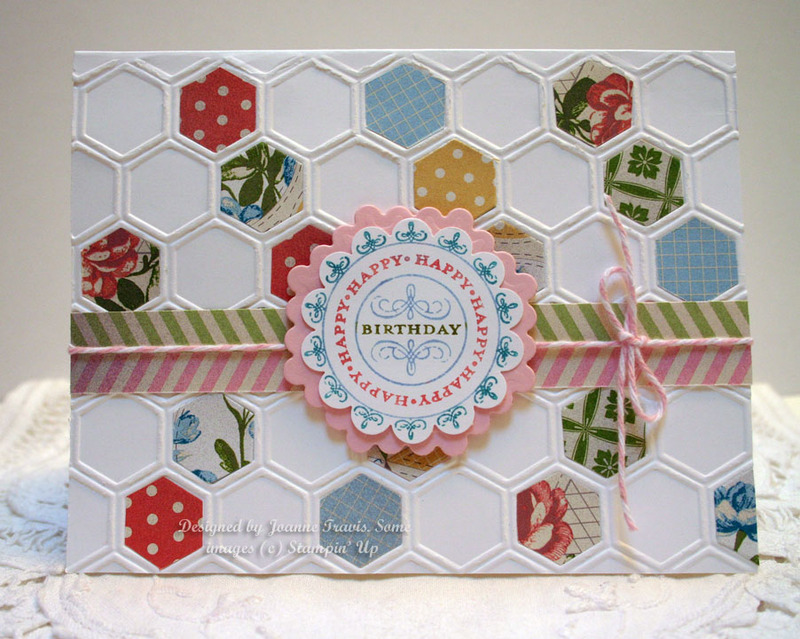 I embossed a few extra pieces of the Tea For Two paper and cut out the little octagons to fit inside the design to give it a quilt like appearance. The sentiment is from Happiest Birthday Wishes inked in various matching ink markers. Stampin' Up supplies: Affection Collection for sentiment, Hearts a Flutter bundle, More Amore paper, Primrose Petals cardstock, with Etruscan Elegance jumbo wheel in matching ink, Newsprint designer paper background. Mojo Monday 273 sketch. Merry Christmas everyone!! 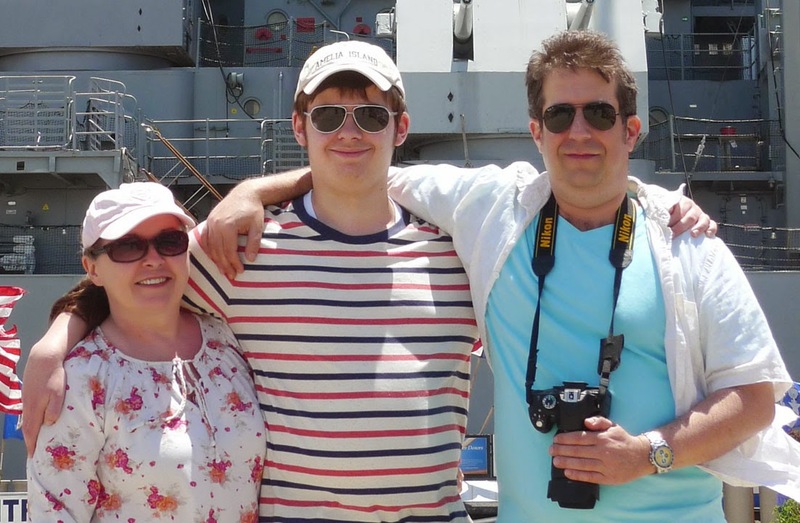 Hope you are all having a wonderful day. Everyone here is off playing with their new electronics and my turkey is cooking away in the oven so I had a few extra minutes to play also. 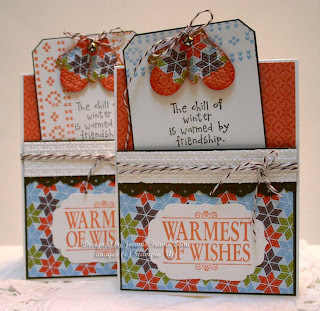 This is the new Secret Garden set stamped in Real Red, Daffodil, and Pumpkin on Whisper White and then shaded with Celery chalk pastels and sponged with Olive. I white embossed the music wheel over whole panel. 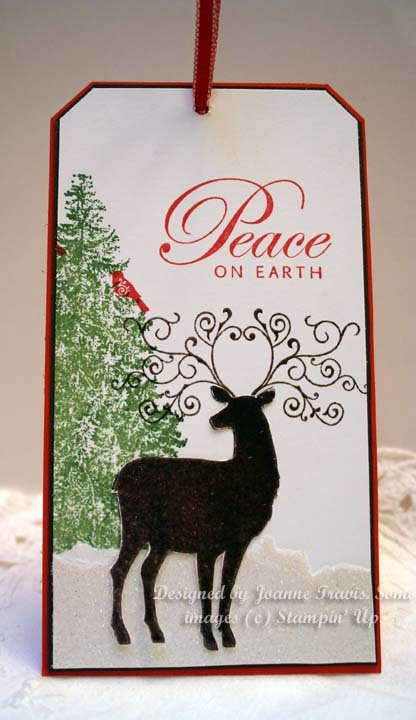 The sentiment is also new and is from the Sale-a-bration catalog (Vintage Verses). Card base is Daffodil (matching taffeta ribbon) with some Old Olive for matting. 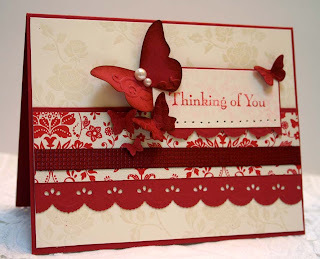 Stampin' Up supplies to make this project were: Close To Cocoa, Chocolate Chip, Whisper White, Basic Black cardstocks and red Glitter specialty paper. The antlers are a swirl Sizzlits, the ears were from the Autumn leaves Bigz die in the last mini catalog, the eyes were various circle punches of 3/4", 1", and 1 1/4". Top Note Bigz die for head. The gummy reindeer noses I found in the holiday candy section at our local supermarket. 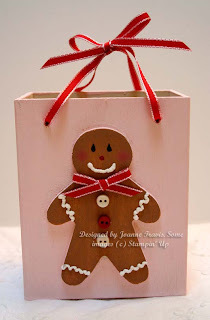 I love all things gingerbread around the holidays so I really couldn't resist picking up this wood box in the dollar section at Michael's. 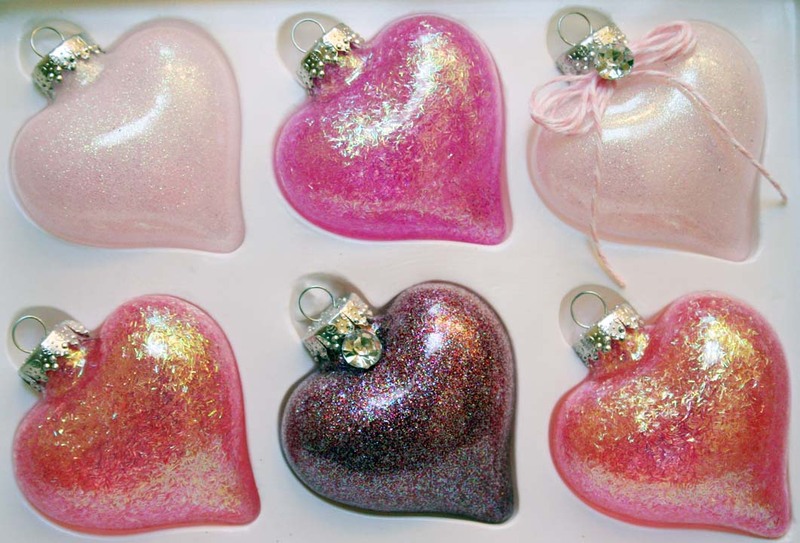 I want to go back and see if they have more and make these for gifts next year, filled with tags. 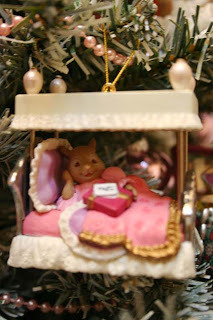 I painted it in pale petal pink and toffee acrylic paints and added Liquid Applique, heated up to make it puffy. 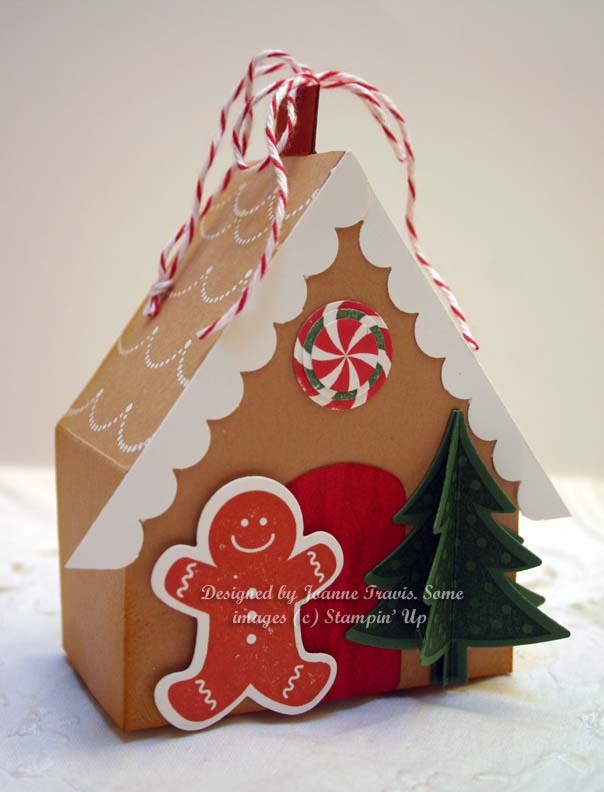 Embellished with mini buttons and Stampin' Up Real Red 1/8" taffeta ribbon. 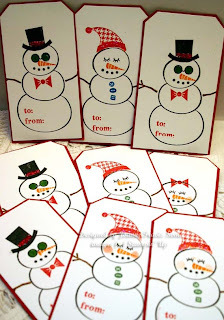 I needed some more gift tags in a hurry so did these assembly line style using Stylin' Snowfolk, Whisper White and Riding Hood Red cardstocks. Added highlights using Stickles and red glitter. I wanted to share another of my trees with you today. This one makes me grin every time I see it. 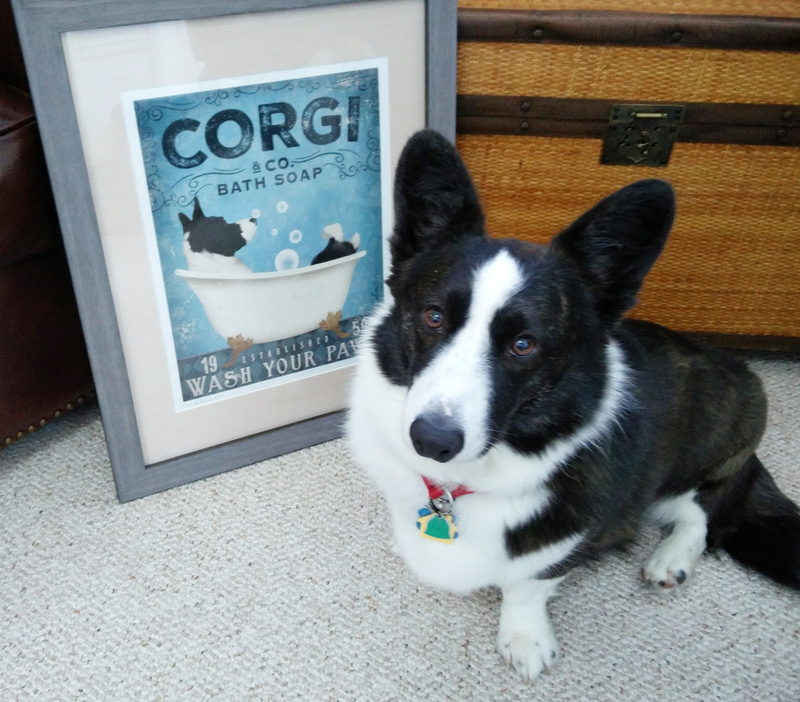 I have it in my main bathroom. 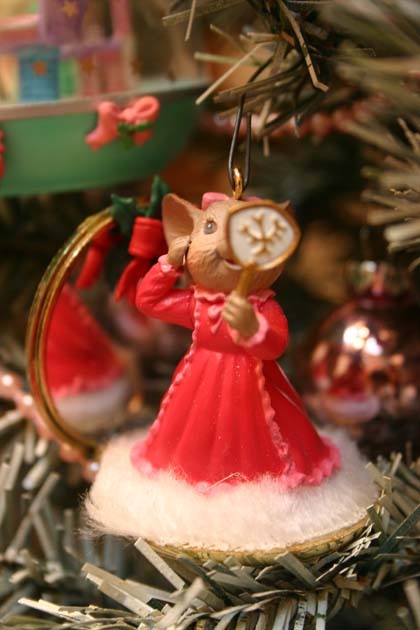 The ornaments are retired ones from Enesco from the Miss Merry Mouse series. The little details on them are really incredible and so very creative. I was so sad when Enesco stopped making ornaments, they were all so wonderful. 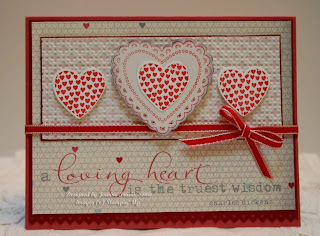 New Stampin' Up: Hearts a Flutter bundle with More Amore paper, Primrose Petals, Cherry Cobbler, Naturals White and Whisper White cardstocks, Real Red 1/8" taffeta ribbon. Mojo Monday 272 sketch. Hershey chocolate nugget candies wrapped in SU Christmas paper (retired), cut at 1" x 3 1/4" for each one. 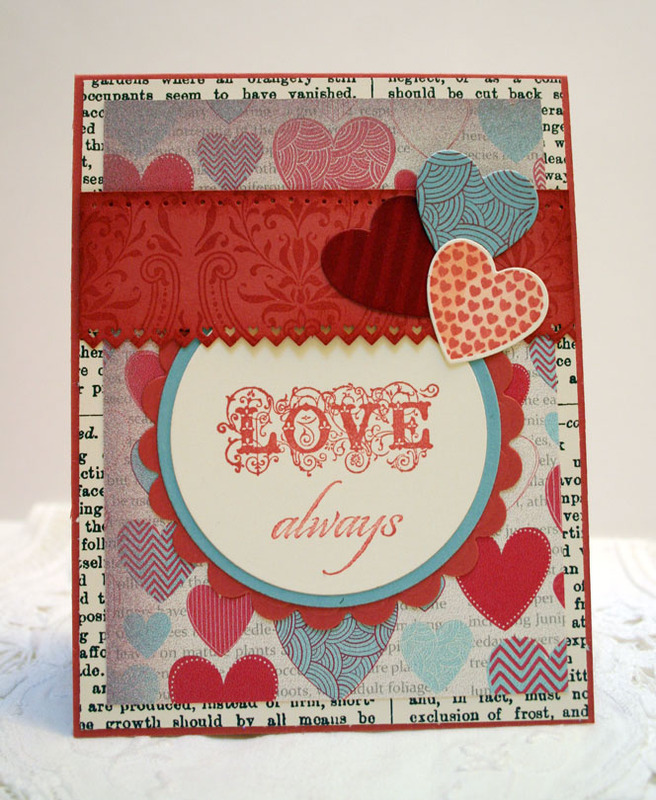 Used Top Note die for topper with Perfect Punches sentiment with Real Red 1/8" taffeta ribbon. 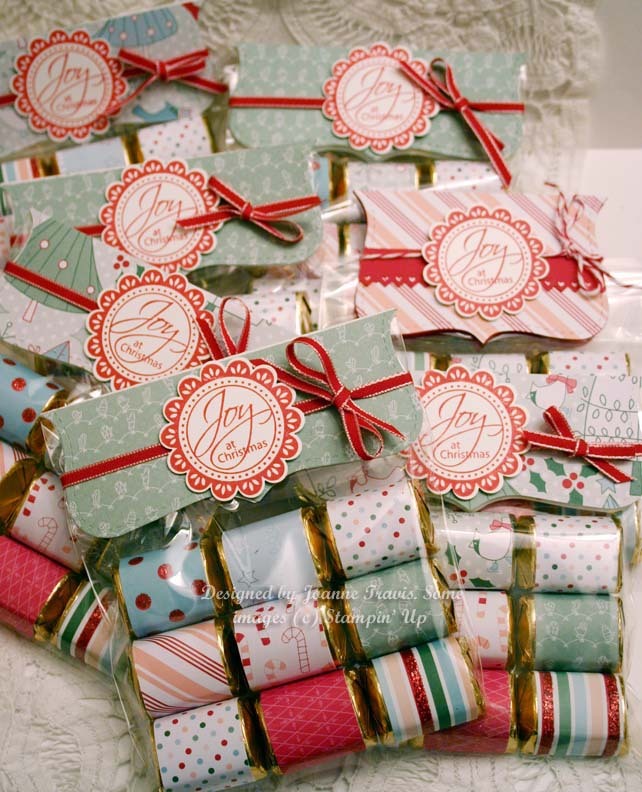 Cellophane wrappers are the A2 card size. 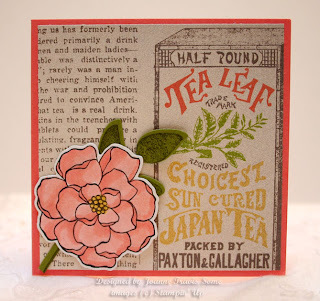 New Stampin' Up previews of Two For Tea designer paper, Vintage Verses stamp set and the most beautiful SU embellishment ever made: Vanilla flower trim. I LOVE this stuff. 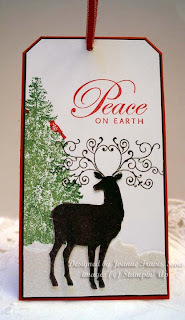 Stampin' Up supplies of Christmas Deer, Christmas Lodge tree, and Greetings of the Season stamp sets, Whisper White, Espresso and Real Red cardstocks, Real Red 1/8" taffeta ribbon. 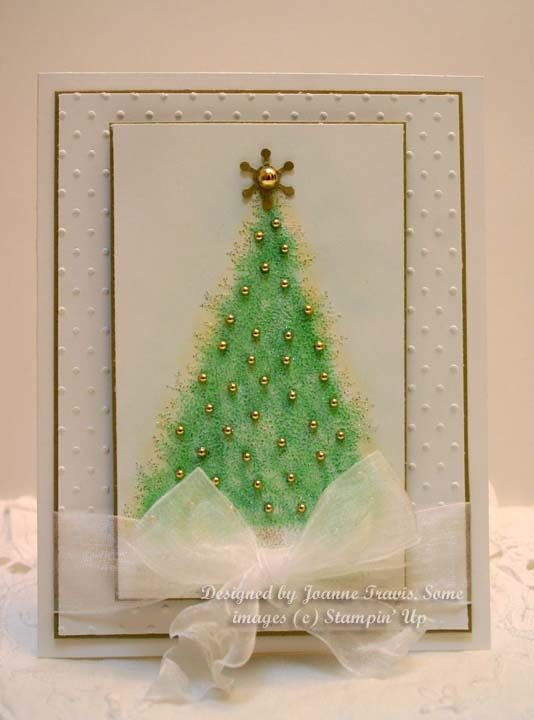 White glitter cardstock is non SU. New SU in the house! 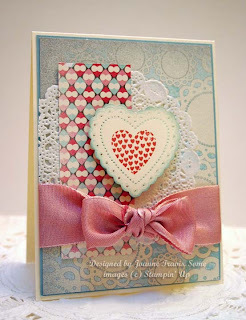 This is the Hearts a Flutter bundle- framelits and coordinating stamp set (primarily for banners). The paper is More Amore and the ribbon is Pink Pirouette. There is another ribbon in the catalog that is like this but a two tone shade combo of Basic Gray and Black. 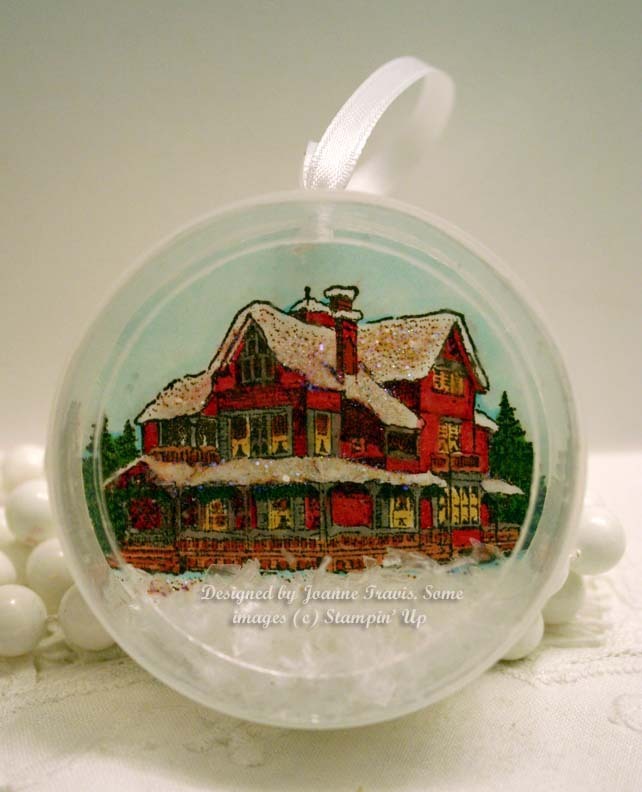 Christmas Lodge was embossed with Iridescent Ice powder and shaded with pastel chalks. 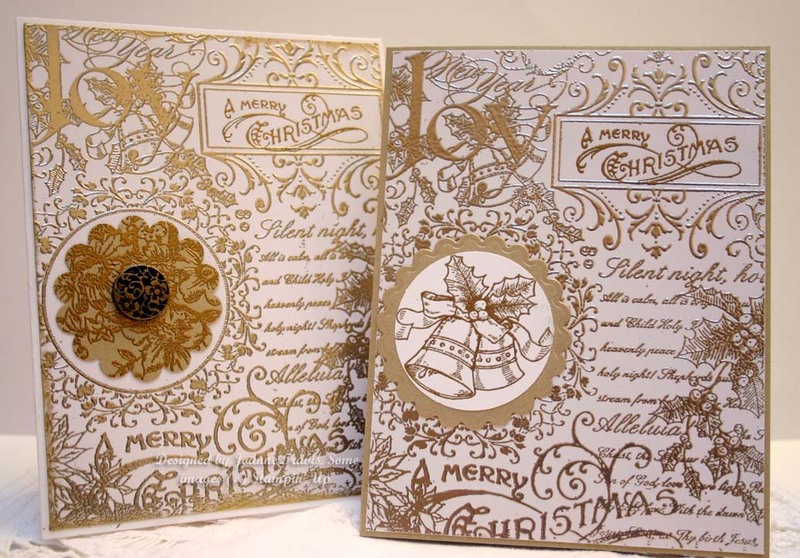 Whisper White and Brushed Gold cardstocks, gold beads and white organdy ribbon (non SU) to embellish. All supplies are Stampin' Up. 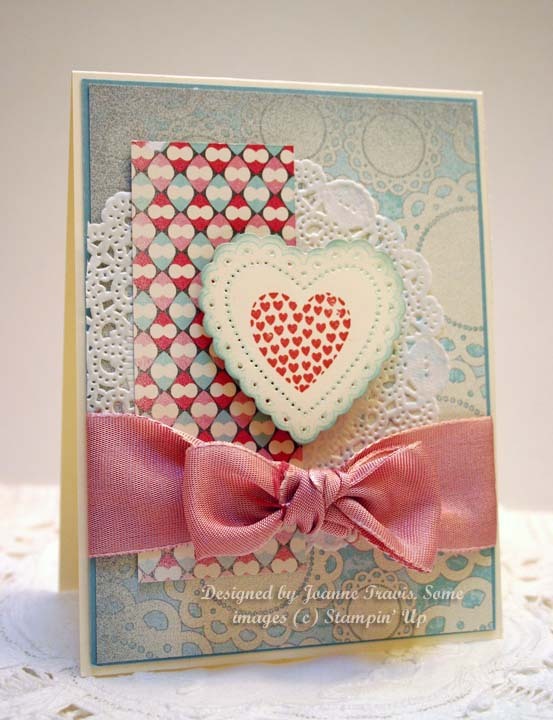 The paper is from the upcoming spring 2013 SU mini and is called More Amore. It is mostly for Valentine's Day but this blue would work with anything. I paired it with Pool Party and Baja Breeze, sentiment is in Night of Navy. The stamp set is Christmas Lodge (my new obsession) inked in Baja and accented with Dazzling Diamonds. The layout is an older one I pinned from May Sketchbook Saturday challenge. Pool Party seam binding ribbon to embellish. 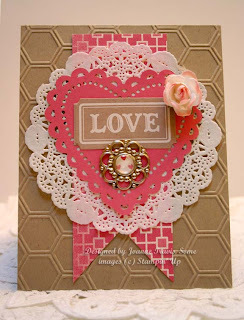 Here are a few of the pieces from the Artisan Embellishments Kit: Doily (also sold separately) rose and ticket, More Amore specialty designer paper, Designer Builder Brads, and Honeycomb textured impressions embossing folder. 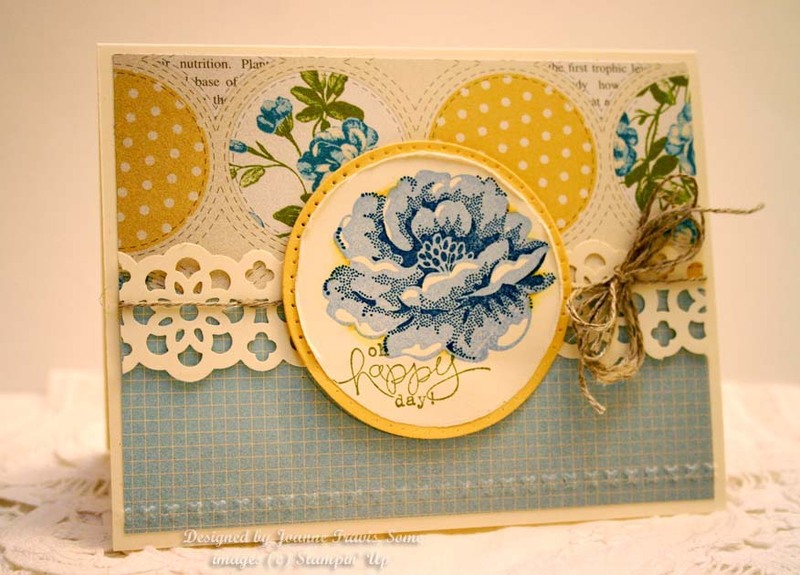 Crumb Cake cardstock. I got a nice little array of items for the sneak peeks of the Stampin' Up Spring Mini available January 3 and some Sale-a-bration sets too that I will be sharing here. 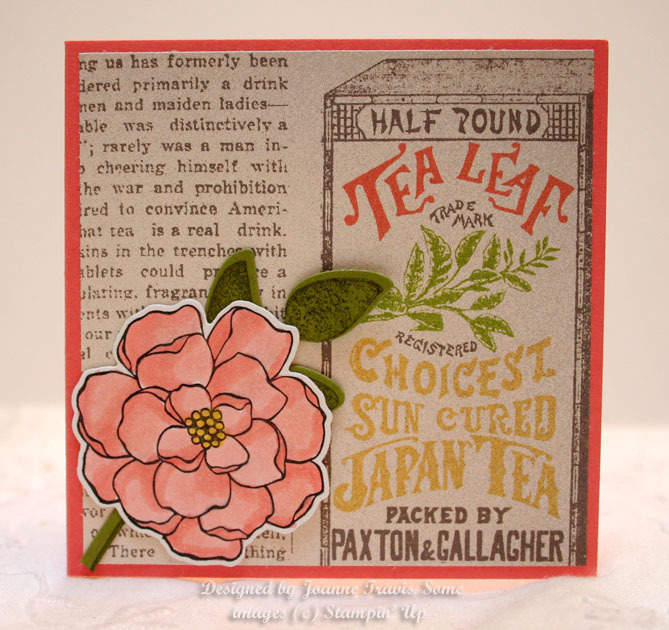 This card uses the new Tea For Two designer paper which is VERY pretty, the embossing stitches folder which comes in a set of two- the other is a pretty scallop edge. The sentiment is from the SAB set Bloomin' Marvelous. The flower is from Stippled Blossoms which is in the main catalog (but new to me). I used my SU punch for the middle strip in Very Vanilla. I couldn't find it in the catalog, so maybe it's retired? Huh, did not know that. Anyway, they have some pretty new adhesive paper strips that look a bit like this and one other design that is lovely also. Lots of new dies, punches, and embellishments in this catalog that are pretty wonderful. Supplies are Stampin' Up. I used the plastic container that the SU embellishments come in and cut out a circle from the lid and added an acetate piece to fit inside the lid. 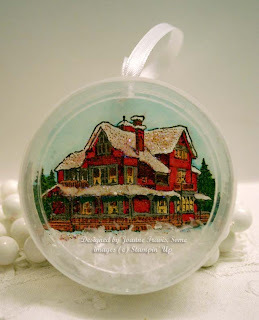 Christmas Lodge image was cut to fit the bottom part of the container and glued down. 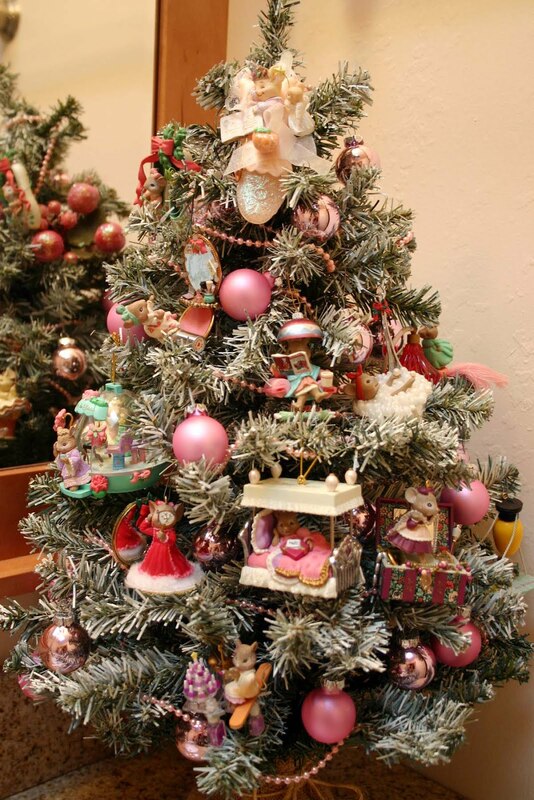 Added Dazzling Diamonds accents and fake snow to inside. 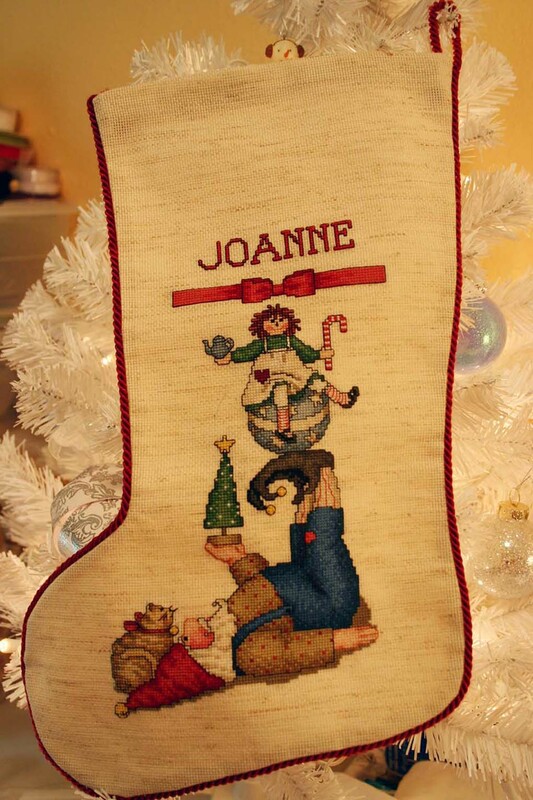 To hang, I punched a hole at the top with the Crop-o-dile and added some white ribbon to hang. 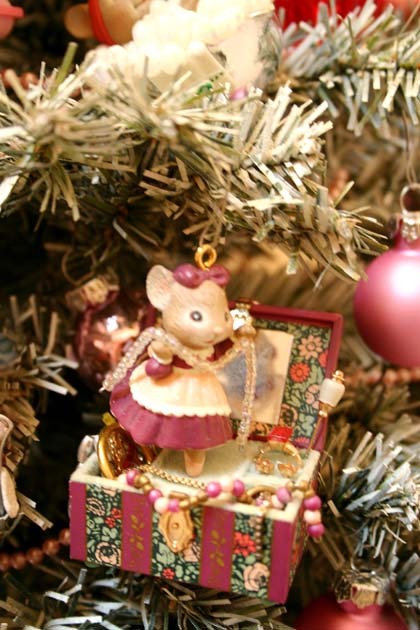 This looks so awesome on my white tree! All supplies are Stampin' Up. 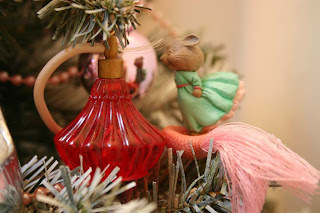 Scentsational Season and Sweets for the Sweet stamp sets, Creamy Caramel, Real Red, Whisper White, and Garden Green cardstocks, red baker's twine. 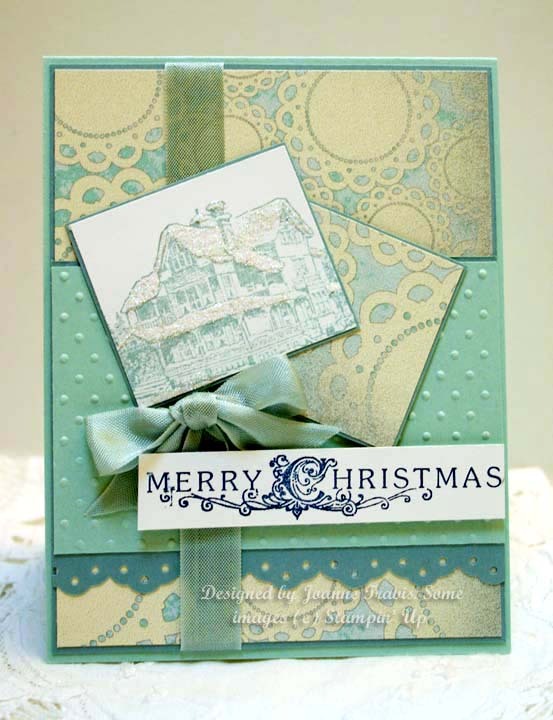 Holiday Framelits, scallop border and old SU key tag punch for shape cutting. The roof was white powder embossed with the retired All Scallops stamp. The house template was found on the internet sometime in my travels. If I find a pattern that I love and will use a lot, I usually make a template out of if with quilter's plastic sheets to add to my favorites collection. 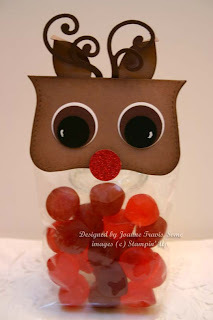 There are loads of cute little templates out there to try, I use Google and Bing images searches to make it easy. All supplies are Stampin' Up. I know this Ski Slope paper is retired but I love it with the new mittens set and punch. It's so Christmas sweater-y. Also used jingle bells and espresso baker's twine to embellish. 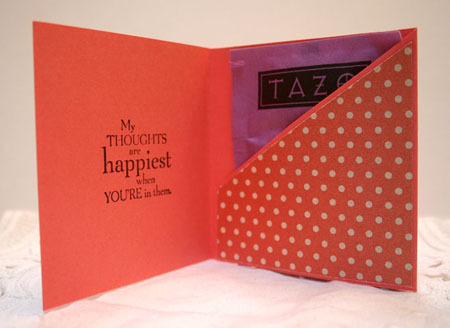 Pocket tag slips into front of card, Whisper White base with Soft Suede matting. 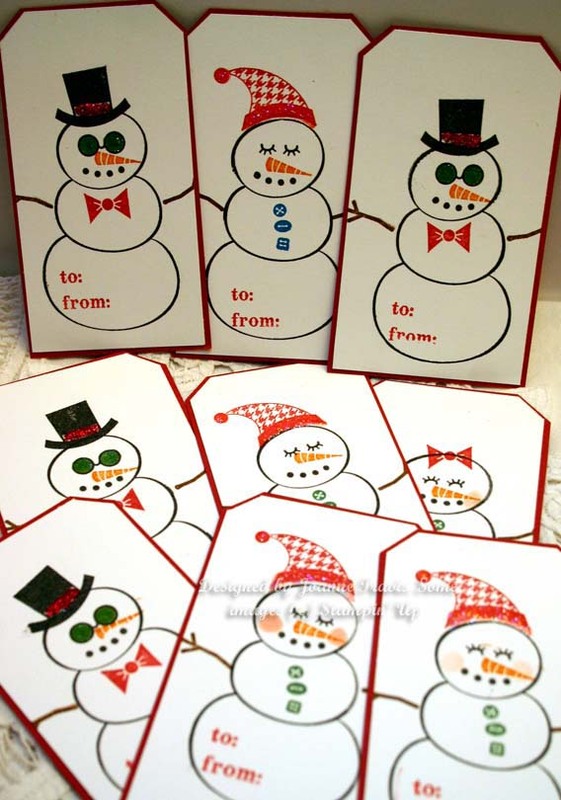 Sentiment on tag is from It's Snow Time and outer one is from Warmest of Wishes. Wheeled Nicely Knit in both Groovy Guava and Bashful Blue. A little something not Christmas related for today! 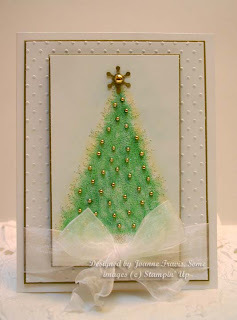 The sketch is from Mojo Monday with Stampin' Up supplies. 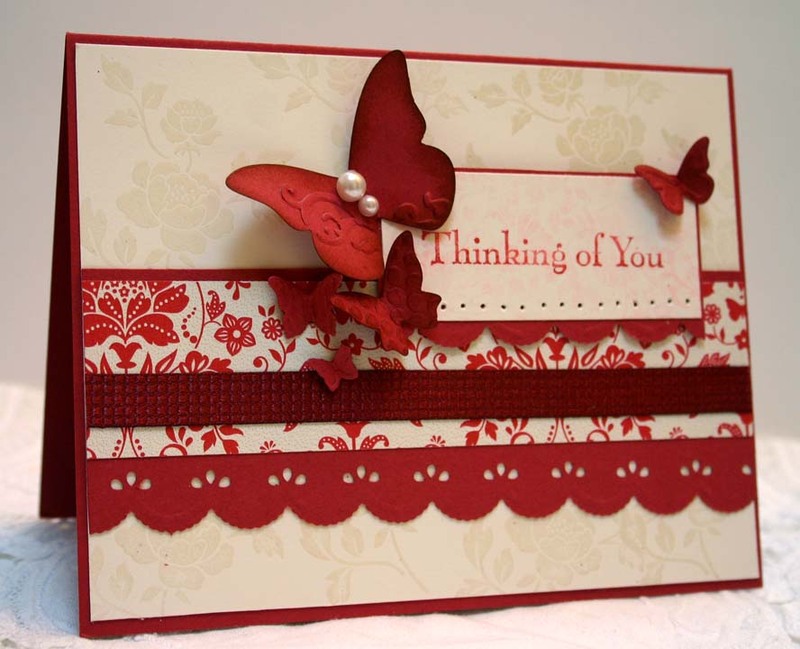 Fresh Vintage designer paper (retired) with You Are Loved stamp set. Very Vanilla base was embossed with clear using the flower from the set, sentiment stamped very lightly with heart image collage in Pink Pirouette because it looked too plain without it. Cherry Cobbler quilted satin ribbon, half pearls, and Sizzlits butterflies to embellish. Border punch is Martha Stewart. 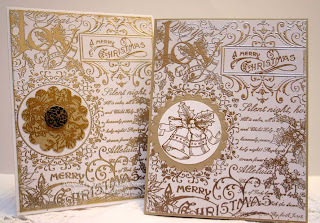 Stampin' Up supplies: Christmas Collage and Bells and Boughs stamp sets embossed in silver and gold on Glossy White cardstock and some Brushed Gold. 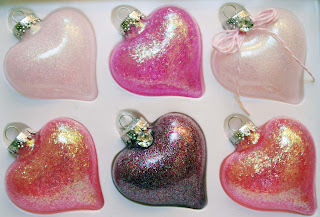 The second photo is one of some clear glass heart shaped ornaments (Ben Franklin Crafts) that I decorated with Glitter It glue and various glitters.